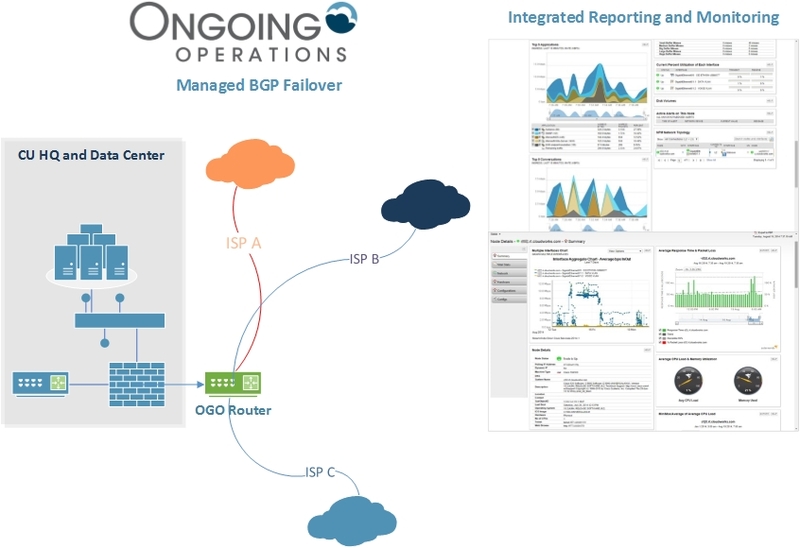 OGO helps clients design and implement BGP failover service. If multiple ISP’s already exist, OGO will create the network diagram, configure the routers/firewalls, and setup performance monitoring for the BGP routing service. Ongoing Operations BGP Failover is part of our Managed Telecom offering. It can be delivered as a standalone product or comes incorporating in many of our products including Connector Pro, our ISP (Internet) service, all of our Cloud hosting connectivity. Together these create a high level of fault tolerance and redundancy so that if you get a Managed Telecom solution from Ongoing Operations it probably has built in disaster recovery so that you can sleep better. Each year when you perform you Disaster Recovery testing, Ongoing Operations will also work with you to test, document and prove to your examiners or auditors that our Managed BGP Failover service works and meets your regulatory requirements. One advantage of the service is that it enables the connection to fail over instantly between the alternative paths. When configured correctly the test and transition are seamless. Border Gateway Protocol or BGP is a routing protocol that is configured at the router. Think about it like a GPS mapping tool that can provide multiple routes to the same location. BGP works the same way where the network administrator establishes multiple ways across the internet and various connections. Once setup, service automatically reroutes if a connection is dropped or a performance problem occurs on one connection.